Today I came across a story that shows at least one publisher know that they should fear self-publishing. 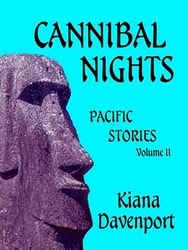 Kiana Davenport is an author who will have the dubious honor of forever being known as the first author to be dropped simply because she self-pubbed an unrelated short story collection. She posted her saga a couple weeks ago on her blog, and it's a little scary. The editor shouted at me repeatedly on the phone. I was accused of breaching my contract (which I did not) but worse, of 'blatantly betraying them with Amazon,' their biggest and most intimidating competitor. I was not trustworthy. I was sleeping with the enemy. It went downhill from there. The publisher demanded that she unpublish the collection from everywhere and that she delete all references to it from Google searches (how the hell do you do that?). They also demanded that she publish nothing until after the book she had sold to them was released in paperback. (Do you see why I say they have the the business ethics of a psychotic dictator?) Given that her book wasn't scheduled to hit paperback until fall 2013, I'm sure you'll agree that their demands are more than a little unreasonable. She declined, of course, so they cancelled the contract and demanded the advance back. Do you know the really interesting detail? This same publishing house had declined the collection, and so had all the other Big 6 publishers. Even though it wasn't good enough for them they didn't want Amazon to have it either. I don't know what's happened in the 2 weeks since this broke, but I suspect that not much has occurred. I, for one, am looking forward to when the publisher sue to get the advance back. Kiana didn't mention their name, so their inevitable public humiliation isn't going to happen until after they file suit. The anger they displayed towards this author was (at its core) inspired by their fear. While they knew that authors could do without them; they were afraid that the authors might reach that same conclusion, hence their panicked and heavy-handed reaction. …a publisher must weigh up carefully the pros and cons of cancelling an author’s contract, since a claim for breach of contract could end up costing the publisher more than it would have cost to publish the book, while leaving the publisher without the revenue from the sale of the book. And that’s without taking into account all of the headaches that litigation can cause: management time used up; adverse publicity — possibly leading to further claims by other authors; documents examined in open court; legal costs and the uncertainty of the outcome; and so on. I wonder if Amazon would want to sue for restraint of trade. I have no doubt that they (and Ms Davenport) have an open and shut case with ample room for punitive damages; I just wonder how much desire they (and B&N) might have to make an example of that particular worm (and thereby fund a lawsuit). This is very unfortunate. I guess, any author should be particular in choosing which publishing services provider to work with. Research on various prospect service provider would come handy. Or, all the bad press she has generated about it will probably sell her a lot of books, and none of this actually happened. Not saying it didn’t happen, but its always a possibilty this was to generate book sales. Wow, that makes me want to buy her book just to support her gumption! I’d come across her story about a couple of weeks ago, and I’m convinced she didn’t make it up as a way to sell her books. Not at all. Publishers are panicky – the digital age is no doubt a real challenge to them – and she was unlucky to have to face people who had lost their cool. Yes, this also makes me want to buy her books “just to support her gumption”! I hope that Amazon who has already turned itself into a publisher will come forward and publish her book. After all, they’ve done it for Eisler, why not for her? That would be a really nice end to the story! Dear Claude Nougat…I just found your comment on this site. Thank you for your support! The publisher was Penguin. They did terminate my contract, and I was forced to return the $20K advance to them.